In the land of one hundred thousand welcomes and nestled in the heart of the magical Kingdom of Kerry, Killarney – the ‘little’ town in the park – opens its doors to you for a welcome night of culture, ‘craic’ and merriment. Join Failte Ireland and our host city of Killarney on Monday, 2nd October, where warm and friendly faces are ready to greet you at over 35 pubs and 80 restaurants and several shops located throughout Killarney’s vibrant and compact town centre. Sample locally brewed craft beers named after regional myths and legends, and meet new Irish friends who are keen to share stories peppered with a witty dose of local folklore. Enjoy cultural experiences, exhibits, activities and tours. 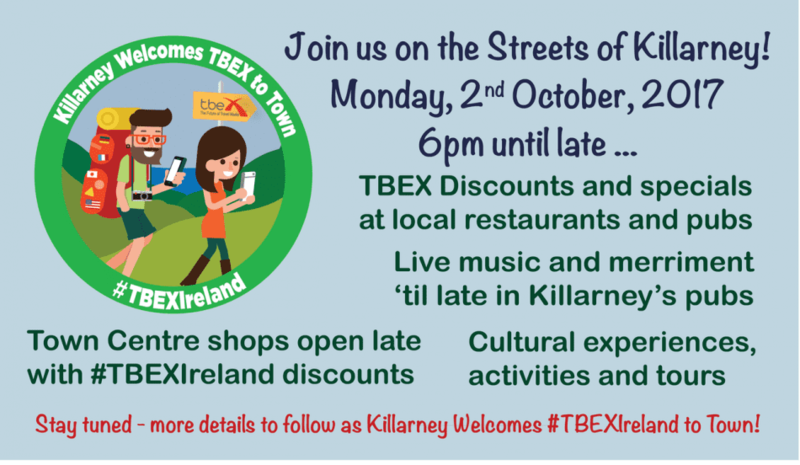 And shop in the village with several discounted rates for #TBEXIreland delegates. As the evening progresses, listen for the sound of music in the night air, and as you follow it to its source, find yourself immersed in a world where ancient history and modern day cultural treasures collide. See you on the streets of Killarney from 6 til late… for one heck of a party! Please note, this evening is self hosted.